Experience six of the world’s most beloved stories in a whole new light! From historical to futuristic, these re-tellings will take you to an enchanted forest, a cursed castle, and far beyond. Uncover secrets of a forbidden basement, a hypnotic gift, and a mysterious doll. Fall in love with a lifelong friend or brand-new crush. Venture to unknown lands on a quest to save a prince, a kingdom, or maybe even a planet. 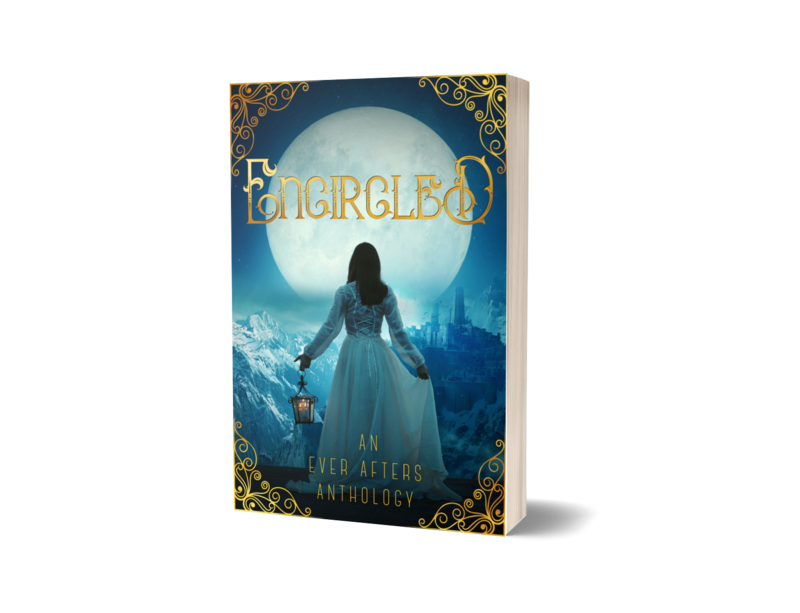 With moments of humor, suspense, romance, and adventure, Encircled has something to offer every fan of fairy tales, both classic and re-imagined. Astrid makes the mistake of landing on a derelict moon base above a planet with a corrosive atmosphere. Inside the base lives Milos, a lonely young man who always wears his space suit and a reflective helmet. The base seems familiar, like from a memory or dream. What isn’t Milos telling her? And why won’t he show her his face? Milos waits for the one destined to break his curse. When Astrid arrives, he realizes she’s everything he’s dreamt about for the last five hundred years. Can she save him before the sorceress who imprisoned him wakes up and destroys them both? You can purchase it from Amazon here, or if you’re in New Zealand, buy with PayPal (link below) or use the contact form to get in touch with me. STATUS: Published in Havok magazine and available for free when you subscribe to my newsletter! EXCERPT: One by one, each sister kisses my veil-clad cheek with the barest touch of lips to lace before hurrying back in line. My sisters with their golden curls. Flawless skin. Limpid blue eyes. Then there’s me—I choke back the sob tearing at my throat. I won’t let them see me cry. Already I’ve been forced to give up everything. For their safety. For the kingdom’s sake. So I straighten my shoulders, tilt my chin to a haughty angle, and give them the merest nod as I pass by. TITLE: The Two Queens of Kyrie Winner in the YA category of the 2015 First Impressions and the 2016 Genesis contests for ACFW. BLURB: Sixteen-year-old Tyrzah inherits an ancient bracelet that awakens a prescient gift within her. When her older sister, the newly-crowned Queen Samara, makes a treaty with the neighboring country Rhüghia, Tyrzah foresees the disastrous consequences. Her warnings go unheeded, and the high priest uses the ensuing chaos to further entrench the worship of the stars. The Nal, leader of the Old Ways, secretly anoints Tyrzah as queen, charging her to lead the people back to the Maker. Torn between saving her sister and saving the kingdom, Tyrzah must develop her emerging talent, dismantle a dangerous cult, and forge powerful alliances. Because only one queen can rule Kyrie. “Are you sure? Shouldn’t it be Samara’s?” Even as I protest, I pick up the bracelet, tilting it so the emerald catches the light with a green flash. A powerful surge sweeps through my wrist and forearm. I inhale sharply and almost drop the bracelet. The contact is painful but exhilarating. As the pain intensifies, my fingers curl around the bracelet. My hand glows golden. My bones are on fire. The air crackles with energy, and my hair lifts off my scalp. I close my eyes. Oil lamps blaze. People crowd the room. My fingertips smooth over the embroidered gold figures on my deep blue silk gown. I glance behind me at the empty throne. “Put the bracelet in the bag.” The quiet words shatter my vision. I’m back on the bed, sitting next to Father. “In here.” He fumbles for the box. I don’t want to obey, but he’s insistent. Finally, I pick up the velvet sack in the box and slip the bracelet inside. The sensation fades. My hand returns to its normal color. The bracelet hums for a moment then falls silent.